Access the complimentary white paper and learn more about the biggest fears in data integration as well as practical tips and advice for overcoming them in order to grow your business through a successful data integration. Download the white paper now. 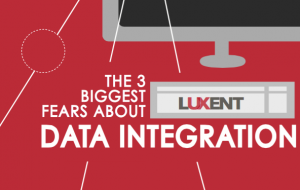 The LiNK Data Integration page to learn more about Luxent’s data integration solution for CRM and ERP. The integration section of our blog. The in-depth data integration interview with Luxent CEO Vivian Keena.